It’s been less than two years since Spider-Gwen first swung into action, but her popularity has propelled her from a one-off story to one of Marvel’s biggest superheroes, with her own comic, toys, and now, an appearance in a Marvel cartoon. 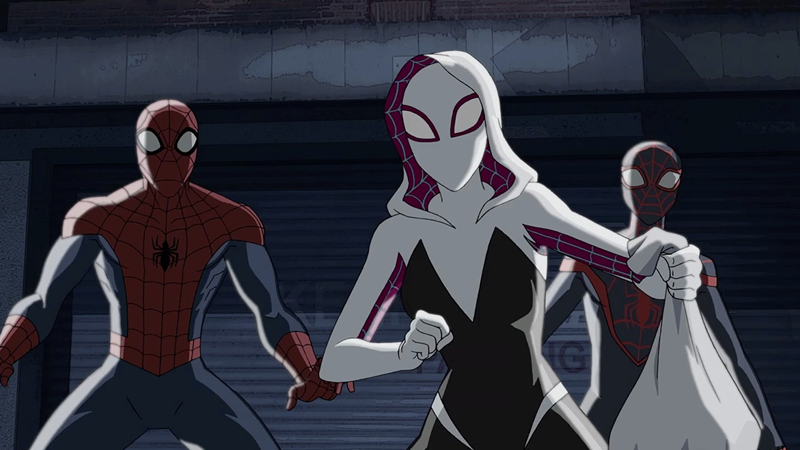 As revealed by IGN today, Spider-Gwen is making her animated debut in the Ultimate Spider-Man cartoon for its four-part season four finale, “Return to the Spider-Verse.” Unsurprisingly with a name calling back to the big comic event that introduced Spider-Gwen to the world in 2014, it’s not just Gwen who’s making an appearance in the show, as Peter finds himself meeting a bevy of new Spider-heroes. Gwen, voiced by Dove Cameron, will be joined by Ben Diskin as Blood Spider, Christopher Daniel Barnes (who played Peter Parker from the ‘90s Spider-Man cartoon!) as Wolf Spider, Troy Baker as Webslinger the Spider Cowboy, Will Friedle as Web Beard the Spider-Pirate, and Milo Ventimiglia reprising his role as Spider-Man Noir. If that wasn’t enough, Spider-Man and friends will be joined by Rocket Raccoon and Howard the Duck in the story, because why not throw in some more characters on top of the zillions of Spider-people? The first part of “Return to the Spider-Verse” airs this Saturday, August 27th, on Disney XD.